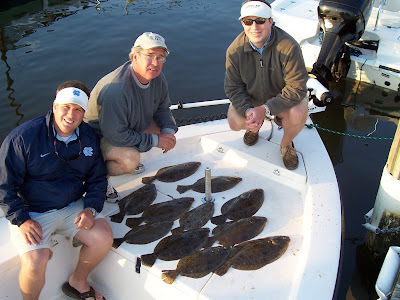 Flounder, Kings, Hatteras Blues and more! 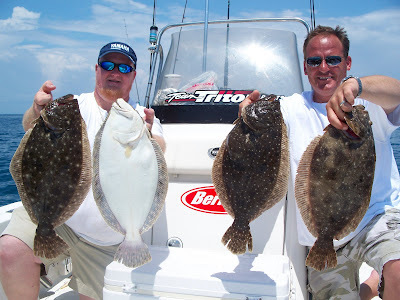 This past weekend through Monday the bite has been excellent in the ocean for flounder, Kings, and Hatteras Blues! All the action is nearshore and is there for the taking! Capt. Mike Taylor 252-725-2623 and myself still have openings for June. Call ASAP once your group knows the date/s you prefer. 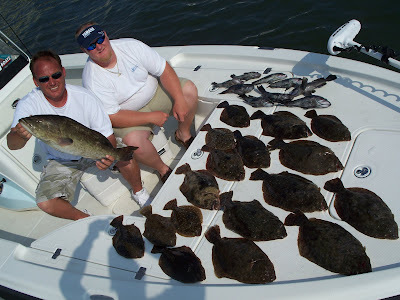 It just doesn't get any better than the flounder fishing off Swansboro! 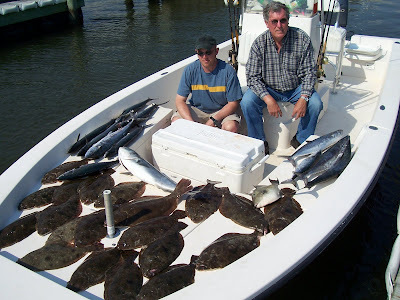 We are also targeting Redfish, Flounder, Sheepshead, Blackdrum and more on the internal waters. The Mahi should show up near the beaches inside of a few miles in a week or two. The Cobia have made their presence again since the warm weather has returned and we should have a good chance at these brutes throughout June. SUNDAY, May 20th NEW! GULP ALIVE! Well, for those of you who love Berkley's line of Gulp Baits.... they've been outdone! No, not by another bait company. When you thought you had the best artificial bait ever made, Berkley has intensified the product making it longer lasting, much softer and flexible, and absolutely irresistable to fish! 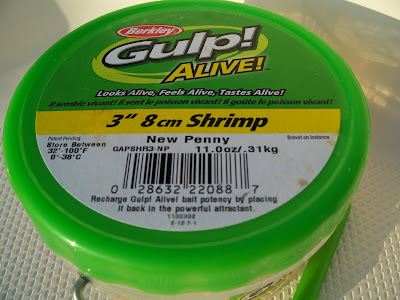 I've said it before and I truly am amazed by Berkley's Gulp baits. 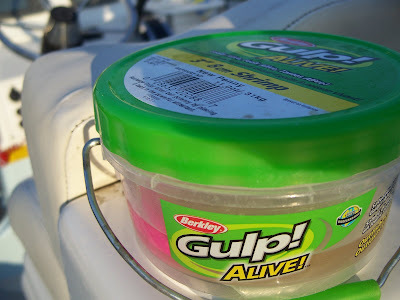 Besides being more Potent, the new Gulp Alive also offers what us Fishermen have been asking for.... they put it in a small tub like conainer that is FILLED with Berkley's Gulp Alive juice! If you could see how big my grin was when I got my first order and realized I could (shhhhh!) drop my gulp baits back into the special sauce when I got done with them... or put my other soft baits into it. PS>..... I also bought a Syringe from the local pharmacy and filled it with gulp juice and injected it into other baits! PS>..... 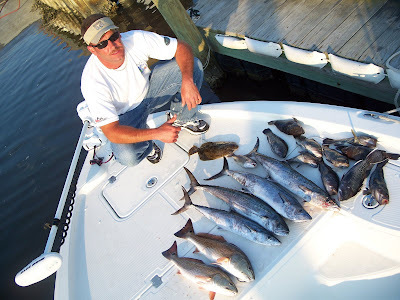 Try shooting some of this into your favorite offshore baits... The Gulp Alive Juice is good into temperatures of up to 100 degrees F. and won't spoil. 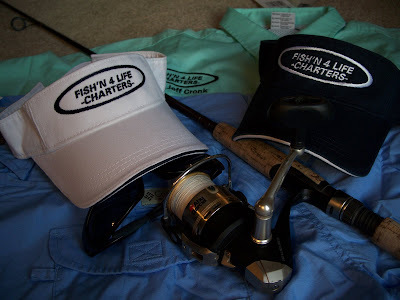 When you get a chance, run by Dudley's or your local Berkley dealer and ask to check out the product! You'll definately want to add a tub to your boat! Sun. 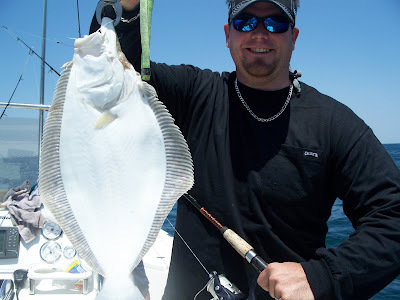 May 20th More Flatfish! Sat. 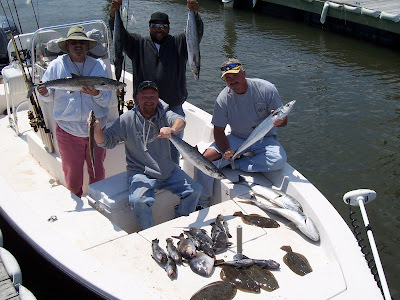 May 19th Great Nearshore and Backwater Bite! Sat. May 19th. Today I had a good ole' Boy onboard. Marty Stevenson and I go way back and had some good times growing up here in Swansboro. I had one of those flashbacks about how fast time is passing by.... But, at almost 38 I can't say I'd like to go back and change anything... I love what I do.... FISH! Well, enough mushy stuff... Today the bite was on in the 5 to 10 mile range for the Kings. They were all keeper snakes from 4 to 10lbs. There were some Bonito and Hatteras Bluefish mixed in too. We caught a bunch of fish trolling deepdiving lures in the 3 to 5in. lengths with hot pink and the green holographic being the best. 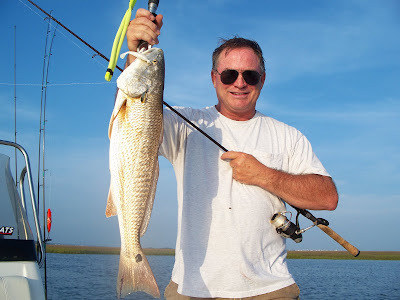 After messing around and keeping a few fish we shot back into the backwaters of Swansboro and worked some shallow water for about an hour and managed 4 hookups on redfish ranging from 20 to 25in. Our best luck on the redfish was using the New Berkley Gulp ALIVE soft baits tipped on spinner baits. Look for the new baits in Dudley's Marina soon. Sat 5/12 FLOUNDER!!! 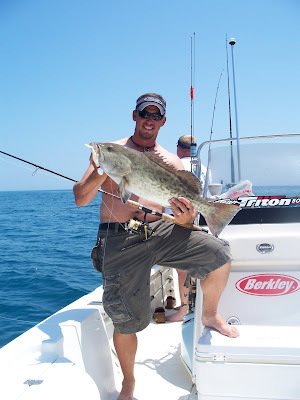 10lb Grouper-Light Spinning Rod! 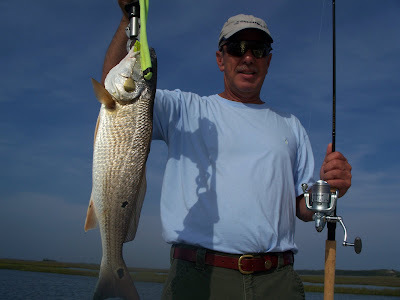 Thur/Fri May 10/11 Reds-Topwater,Spinner baits. Thursday and Friday I had a native to the area onboard. 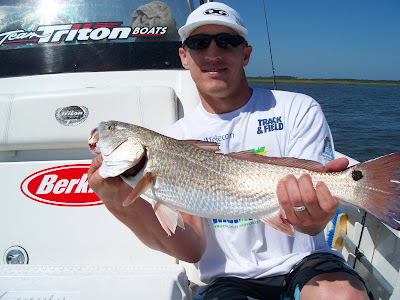 John and I set out thursday right after the extreme winds and weather settled down to try and relocate some redfish. We found reds in almost every area we tryed but the sizes were small. The water clarity inside was a little chalky. The reds we found would strike the topwater baits but not committ. So we tryed spinner baits and that did the trick. On friday we were back out there scouting out some different areas. 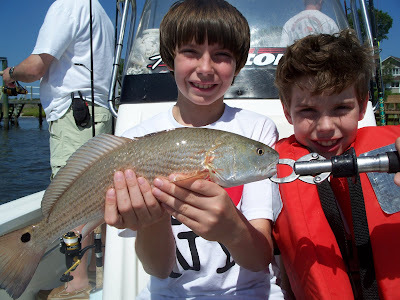 The first couple places didn't produce but we found some areas with better water clarity and the reds were there. We cornered a pod of reds into a back bay in some flooded marsh and had multiple strikes and hookups off it. 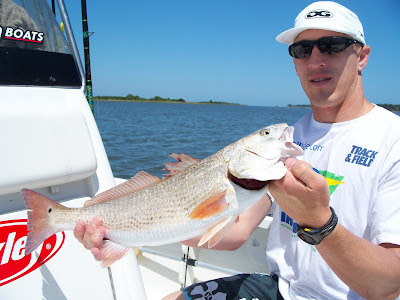 We managed to pull out and release two that would be a definite money maker in a redfish tourny. Good job guys! 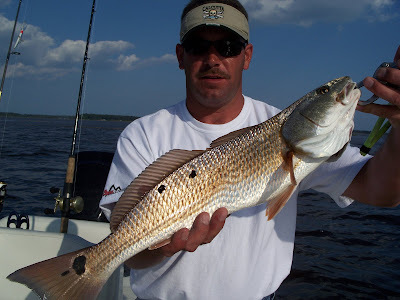 5/5/07 Redfish on the flats! Well, the weather report was really sketchy for this Sat. So, in the best interest of my clients, who were driving down from well inland, I suggested we rebook for another date. 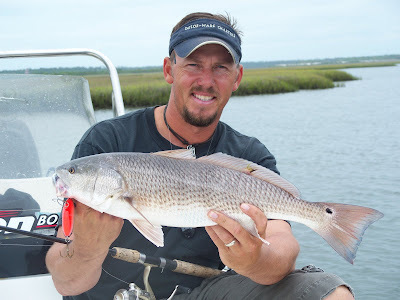 As you'de figure, the crazy weather pattern provided a short break between the wind and rain.... so, Ben Licko, a good friend from Swansboro, hopped on for about an hour and we went and scouted some shallows for redfish. We had three hook-ups and then headed back to the dock. After dropping Ben off, Capt. Mike Taylor hopped on and we went a different direction to check out another area. We also found some 24 to 26in reds working some small creek mouths on the beginning of the falling tide and had strikes on Topwater baits. 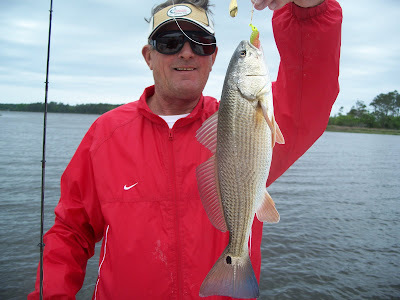 The redfish have moved into the backwaters around Swansboro very well... Call now for open dates in May and June. Capt. Jeff Cronk 910-326-7512 or Capt. Mike Taylor 252-725-2623.